Sienna, Turkey Madonna, Shutesbury, Massachusetts (2010). Courtesy of the artist and Dina Mitrani Gallery. Lyntonâ€™s choice of medium also connects directly to her desire to slow down. In a world where many photographers prefer digital cameras and the instant access to each image, Lynton uses film. One has to compose, shoot, and often pray that what was desired was captured. Some young artists have opted to use film in an effort to work slower and purer than by using digital cameras. Holly Lynton is a Yale and Bard educated artist who has taught at both Amherst College in Massachusetts and the Aegean Center for the Fine Arts in Paros, Greece.Â Lynton has exhibited throughout the United States and Europe, but this is the artistâ€™s first solo exhibit at the Dina Mitrani Gallery. 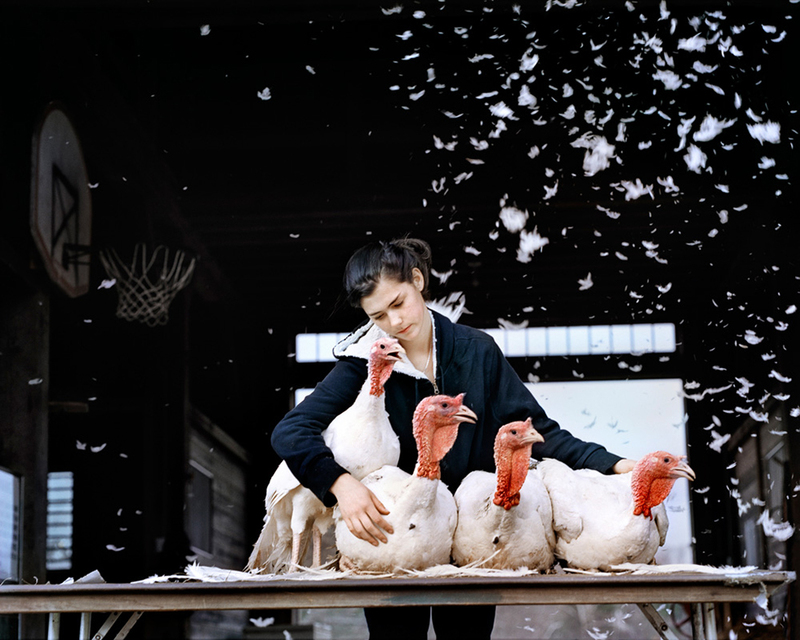 Through her artist statement, viewers learn that Lynton is not only seeking to make observations about farming in New England, but also wants her imagery to connect on a metaphysical level. â€œNot always overt, I look for gestures and draw inspiration from religious paintings, mythology, and iconic tales of struggle to convey a sense of mysticism that is in the everyday.â€Â There is certainly a sinewy connection to such grand aspirations within the compositions in many of her images. Shorn, Shutesbury, Massachusetts (2011). Courtesy of the artist and Dina Mitrani Gallery. â€œShorn, Shutesbury, Massachusettsâ€ features a sheep shearer lovingly sheering the wool off a limp and languid sheep and yet has a striking resemblance to Michelangeloâ€™s â€œLa Pieta.â€ Even though the gestures are not exactly the same and the manâ€™s body looms a bit awkwardly over the sheep, the tenderness that the sheep shearer exudes is clearly that of a parent holding a child.Â Likewise, â€œSienna, Turkey Madonna, Shutesbury, Massachuettsâ€ depicts a woman lovingly huddling together four turkeys with a maternal protective tilt of her head, as the viewer sees a basketball hoop in one corner and feathers flying in the other. Is she leading them to slaughter? Â Feeling guilty? Or protecting them as she would her own young children? Les, Amber, Honeybees, New Mexico (2008). Courtesy of the artist and Dina Mitrani Gallery. Stephen, Mayflies, Oklahoma (2009). Courtesy of the artist and Dina Mitrani Gallery. 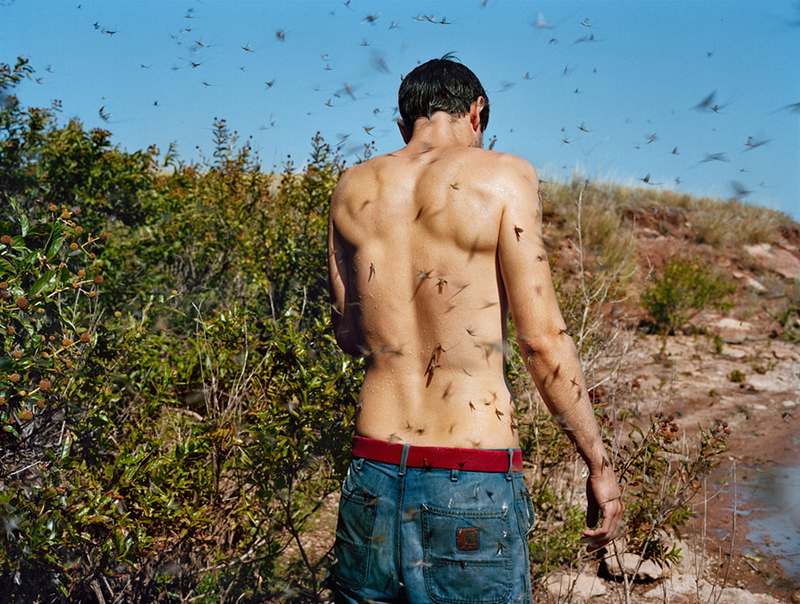 â€œStephen, Mayflies, Oklahomaâ€ depicts a shirtless young man engulfed by flying insects in a scene reminiscent of the Biblical locust plague in Exodus or Tippi Hedren in â€œThe Birds.â€Â His head tilts down so that the flies donâ€™t engulf his eyes. Is there also a sense of guilt? Is this beast of his own making? Is this a subtle reference to GMO agricultural processes and the Frankenstein madness that may be the consequence? 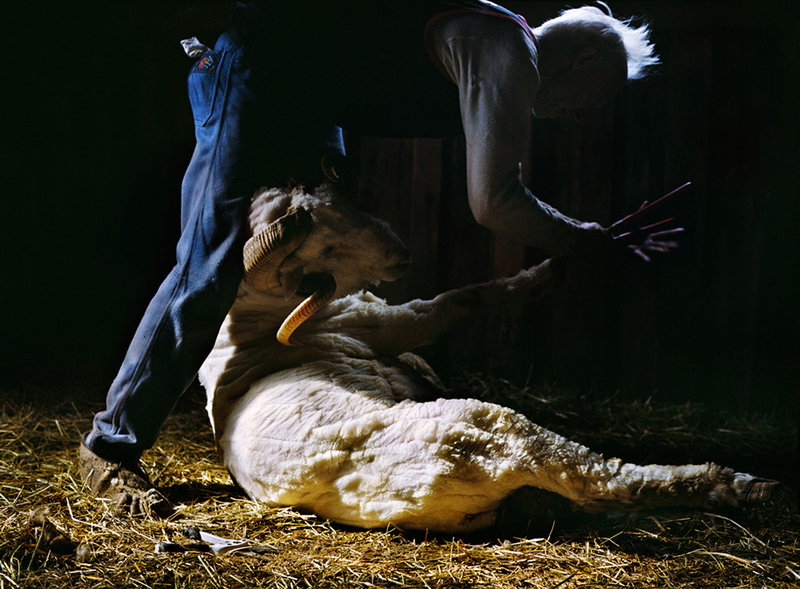 The conflict of man versus nature is evident throughout this exhibition.Â The tension of the love-hate relationship between farmers and their work is also manifest.Â And by avoiding the paraphernaliaÂ of modern corporate farming, Lynton links the viewer with a dance and rhythms that have endured for millennium.